Baz Luhrmann’s The Great Gatsby is a profound disappointment, but I guess we already knew that. Critics and audiences were lining up to criticize his adaptation of the classic American novel before it even opened. While any adaptation of a much-loved book is bound to suffer a few slings and arrows of public opinion, the presence of Luhrmann brings an extra level of scrutiny: the divisive director unequivocally embraces romance, glam, and glitz with the enthusiasm of a teenager, a major faux pas in our Age of Irony. He previously applied this adolescent sensibility to Moulin Rouge! and William Shakespeare’s Romeo + Juliet, and his Gatsby hits many of the same beats – the acceptance of a young romantic into a hedonistic world, the awkward meet-cute, the doomed romance, and the cartoonishly aristocratic villain. But Luhrmann genuinely loves a good party and is the perfect director to capture the pulsing world of the Roaring Twenties to which Gatsby’s young protagonist, Nick Carraway (Tobey Maguire) succumbs. It’s when the story requires him to examine its dark underbelly of that world – and ultimately reject it – that he falls short. Luhrmann doesn’t seem to know quite where to go when the party ends. The first act offers a master’s thesis on satisfying commercial filmmaking. As we meet Nick (and Nick meets the party), Luhrmann’s camera dips and dives with certainty, never lingering too long on any pleasure or vice. This carousel of wine, women, and song reaches its penultimate moment when Leonardo DiCapiro makes his first appearances as Gatsby. After his legend and mystery has been conveyed to the audiences through rumors, innuendo, and gossip, the reclusive millionaire greets Carraway at a party and bestows a “reassuring smile” upon him and the audience, as fireworks dance behind him and Gershwin’s “Rhapsody in Blue” swells on the soundtrack. It is quite simply one of the great screen entrances in film history. If you have attended high school in America in the last half century, you know the rest. We learn that Gatsby has a history with Nick’s cousin Daisy, and he employs Nick to help them reunite Later, Nick watches as Gatsby tries to pull her away from her husband, Tom (Joel Edgerton). Class differences bubble to the surface, and tragedy strikes several members of the ensemble, while Nick watches and judges. Luhrmann wisely highlights Nick’s journey with a framing device not found in the novel. The film opens with Nick in a sanitarium, where, in recovering from “morbid alcoholism” and depression, he tells the story of his relationship to Gatsby to a staff doctor. This original narrative turn gave me high hopes that Luhrmann would do something interesting with the character, but the perpetually youthful Maguire is too perfect a choice for the young, naïve Nick. He hits all the expected notes but fails to bring any unique shadings. 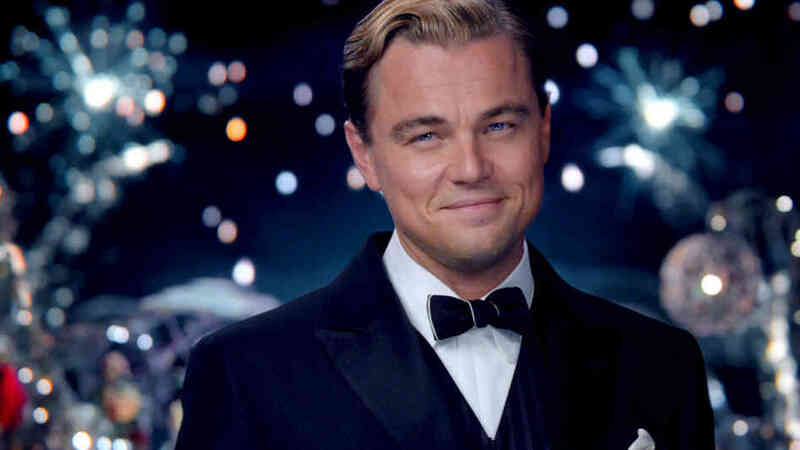 DiCaprio is a similarly obvious choice for Gatsby but a far more effective one. Despite his obvious dedication to his craft, there has always been a mystery, even an emptiness, in his eyes that might stem from having grown up as a star and having never struggled. To me, DiCaprio still seems to be that teen idol struggling for acceptance among the adults of the world. Far too often, you can see him trying on screen. All of which makes him a perfect Gatsby, whose invented background makes his character more of a role than a full-fledged person. But Luhrmann’s film does not do DiCaprio’s performance justice, as everything that follows Gatsby’s glorious introduction seems denouement. In a sense, he is half of the perfect director for the film; perhaps someone with a more tragic sensibility should have taken over after the first act. Luhrmann seems to have no understanding of what makes people tick, only what makes them sing and dance. While it would be easy to blame the film’s failure on Luhrmann’s teenage sense of romance, there is more to unpack here, and I’d argue that each generation gets the Gatsby that they deserve. Class issues course through our public discourse these days, and the wealthy, whom Fitzgerald’s novel incisively deconstructed, are still the engines that makes us run. We appreciate the glam and the glitz of modern celebrities – read magazines about them, watch their awards’ shows, and buy their endorsed products – knowing all the while that it’s not what we should value. But if Luhrmann seeks to pull back the curtain on our celebrity culture, he finds nothing good underneath. Fitzgerald wrote Gatsby as “the most hopeful man” you will ever meet, but, as depicted by Luhrmann and DiCaprio, his hope seems more like obsessive dysfunction. This may be why Carey Mulligan’s Daisy, the object of his uber-affection, barely registers as a character here. She is only the object of obsession, and the specifics of her character are irrelevant. But if Luhrmann can’t figure out what really lies beneath our American pursuits of love, fame, and wealth, well then, perhaps, it’s because none of us do these days. That very word, “hope,” has been diminished of late, and our films reflect it (the word figured prominently into the nefarious plans of the villains of The Hunger Games and The Dark Knight Rises). Perhaps ours is just not a hopeful time, and the failure of Luhrmann’s film is that he still thinks it is. In other words, this is the perfect Gatsby for our era – a repudiation of our culture of wealth that leaves a void we’re not quit ready to fill. It fails as a piece of entertainment, but you’ll be hard pressed to find a better representation of our society’s conflicted values towards the wealthy and our pervasive celebrity culture.